New coach Gary Andersen should be a great fit in Madison. Offensive coordinator Andy Ludwig could face significant challenges in his first season at UW because of personnel issues. Ludwig should have several playmakers at his disposal, including tailbacks James White and Melvin Gordon, wide receiver Jared Abbrederis and tight end Jacob Pedersen. While the Badgers have playmakers, the quarterback battle could extend deep into fall camp. Junior college transfer Tanner McEvoy, who redshirted at South Carolina in 2011 before transferring to Arizona Western College, has three seasons of eligibility remaining. He’ll likely battle Joel Stave and Curt Phillips. Stave, a sophomore, took over in Week 4 last season and started six games before suffering a broken collarbone. Phillips, a sixth-year senior, started the last five games in 2012. He has battled through multiple injuries to his right knee but remains a legitimate running threat. McEvoy is considered the best fit for the offense. However, it's uncertain how quickly he can adjust to the higher level of competition in the Big Ten. Also, injuries left UW with only eight healthy linemen in the spring, and the staff acknowledges that the overall depth isn’t close to where it needs to be. Lastly, the wide receiver position beyond Abbrederis remains full of unproven players. UW needs to find a second threat, and no one emerged during spring ball. Aranda, who plans to use three-, four- and five-man fronts and use zone blitzes liberally, should have the personnel in the front seven to get after opposing quarterbacks and ease the burden on a secondary that will be green with only one returning starter (safety Dezmen Southward). UW has a surplus of experienced linemen, and Aranda’s flexibility and desire to attack appears to be a perfect fit for players such as Brendan Kelly, Vince Biegel and Tyler Dippel — all of whom will see time at end/outside linebacker — along with senior linebacker Chris Borland. Opponents know about Borland’s playmaking ability, but Biegel, who played in two games last season before a broken foot forced him to redshirt, could be an outstanding pass-rusher. UW suffered a blow in April when senior David Gilbert, who had been hampered by injuries to his right foot in each of the last two seasons, announced he was leaving the program. Chris Borland, LB — Veteran should be disruptive as the Badgers employ multiple fronts and blitz packages. Dezmen Southward, S — Fifth-year senior will be the lone returning starter in the secondary. UW needs him to be solid. Jared Abbrederis, WR — UW’s only legitimate threat at wide receiver, the fifth-year senior averaged 17.1 yards on his 49 catches in 2012. Kyle French (10-of-16 field goal attempts) and Jack Russell (0-of-2) were inconsistent last season, which led to uncertainty for most of the season. French was outstanding in the spring, but will that carry over to the fall? Punter Drew Meyer (41.5-yard average, 14 punts of 50-plus yards) was solid as a redshirt freshman but must improve his hang time. New UW coach Gary Andersen needed only four seasons to transform Utah State’s football program from dysfunctional to dynamic. Last season the Aggies won 11 games and secured the school’s first bowl victory in 19 years, and in the process passed Utah and BYU to take over the No. 1 spot in the state. Andersen wasn’t actively looking to leave Utah State in December when Wisconsin athletic director Barry Alvarez offered him the coaching job — Andersen had already rebuffed overtures from California, Kentucky and Colorado — but he was intrigued by the opportunity to coach on a larger stage and respected the UW program. Andersen believes UW can compete on a national level, and the players who return in 2013 believe a fourth consecutive Big Ten title is a realistic goal. 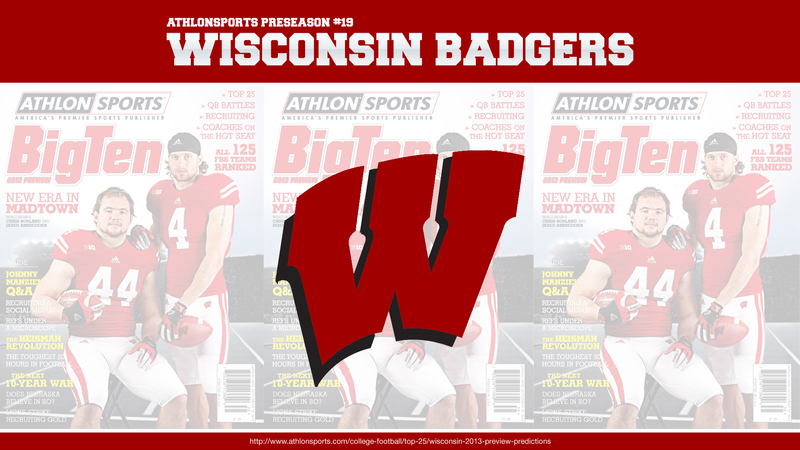 Who Should Start at Quarterback for Wisconsin in 2013?